Shelley Freimark, MD is a Physical Medicine and Rehabilitation and Pain Management physician at the Brain + Spine Center who evaluates referred patients to determine the best conservative treatment options for their spine or back related pain. She also treats a wide variety of general rehabilitation issues. Dr. Shelley Freimark was raised in Jenison, Michigan. She received a Bachelor of Science degree at the University of Michigan in 1991 and attended Wayne State University School of Medicine, obtaining her Medical Doctor degree in 1995. She completed a transitional internship year at St. Mary’s Hospital in Grand Rapids Michigan, and a Physical Medicine and Rehabilitation Residency at Sinai Hospital in Detroit. From September 1999 to December 2005, Dr. Freimark ran a very successful PM&R practice in Kentucky. 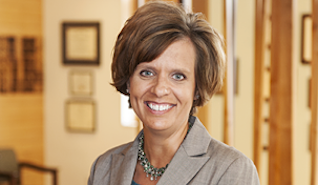 She has been practicing at the Brain + Spine Center since January 2006 and practices part time in Physical Medicine and Rehabilitation at the St. Mary’s Spine Center, in Grand Rapids. Dr. Freimark is a member of the American Academy of Physical Medicine and Rehabilitation, the American Association of Neuromuscular and Electrodiagnostic Medicine, American Medical Association, Michigan State Medical Society, and North American Spine Society. She lives near Grand Haven with her husband and three young daughters, all who are active in Tae Kwon do. 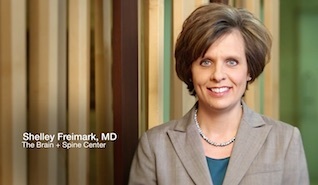 Dr Freimark enjoys pilates, reading, and downhill skiing in her free time. Dr. Freimark also specializes in nerve testing for the diagnosis of a variety of neuromuscular diseases. “Patients or referring physicians might not realize that most patients with back or joint pain don’t need surgery. My specialty is designed to treat musculoskeletal issues non-surgically, but also trained to know when surgery is necessary. Physiatry is the best “1st step” in the treatment process”, says Dr. Freimark. How was your experience with Dr. Freimark?